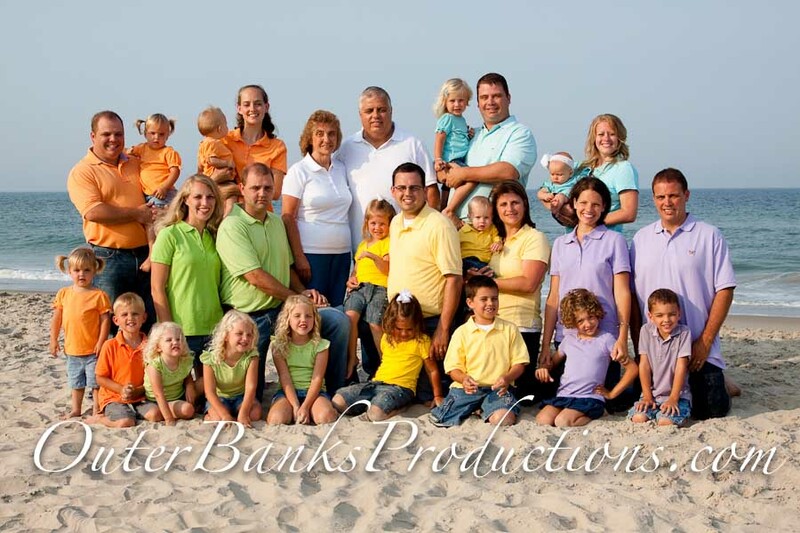 This is a group shot of several families that all decided to show each family with its own beautiful colors. This family decided to go for simple and comfortable. 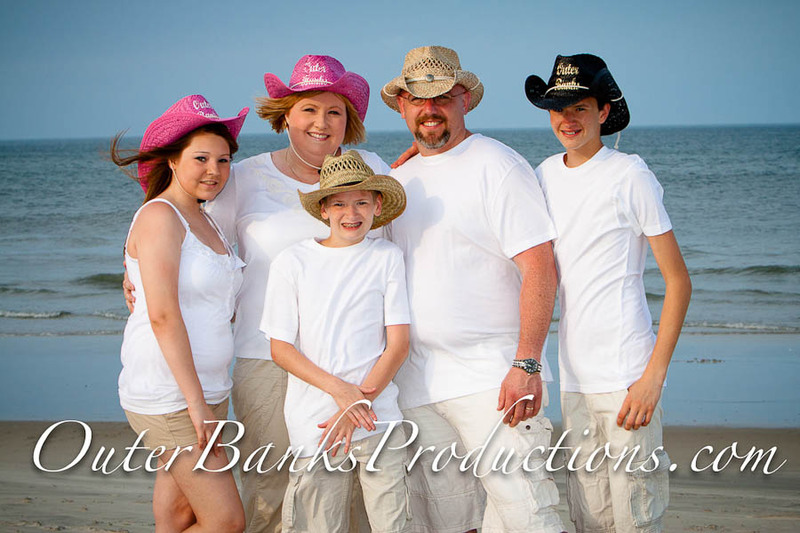 Although patterns are not always recommended, this family really found a happy mix and found patterns that were rather large and easy to photograph. 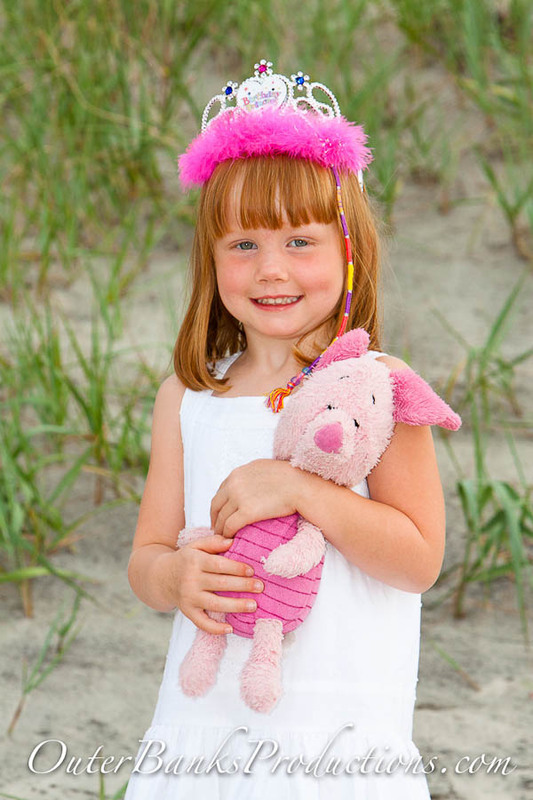 Just a fun head ornament and a simple stuffed animal made this shot an instant classic. 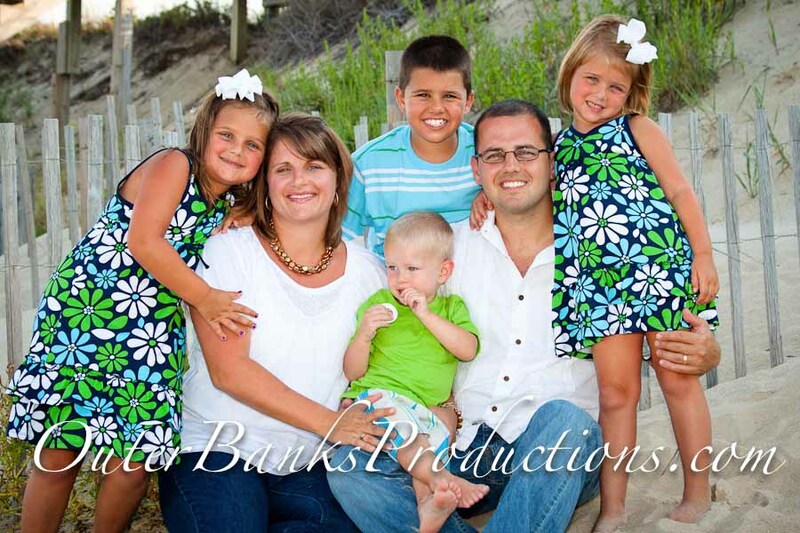 We do not see this very often but this family decided to use color to make a wonderful portrait! This group works together. The shirts and hats are from their company. 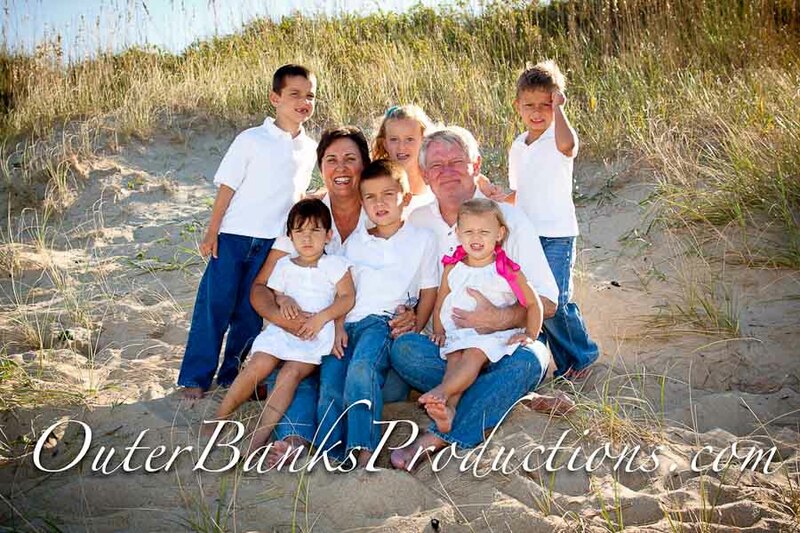 They then changed clothing for their individual family portraits. A perfect example of classic family portrait attire! 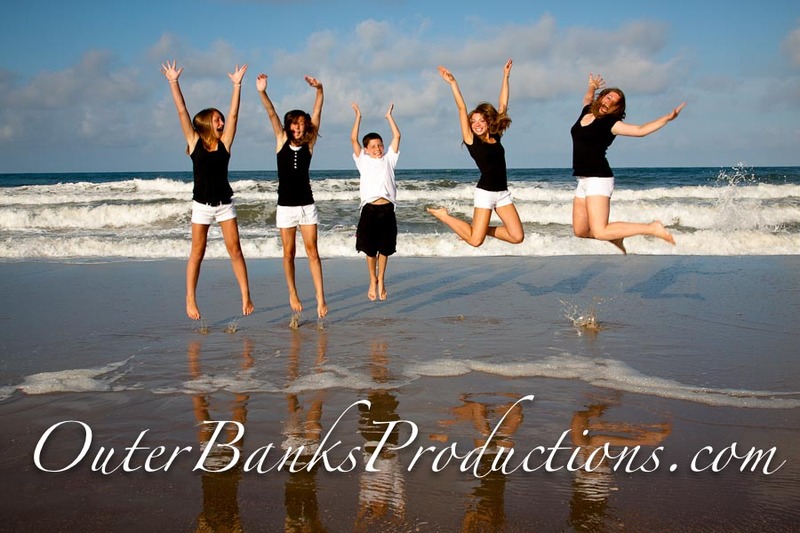 And they were very happy to change and get back into their bathing suits! If you are really casual, here is a great example of what to wear. 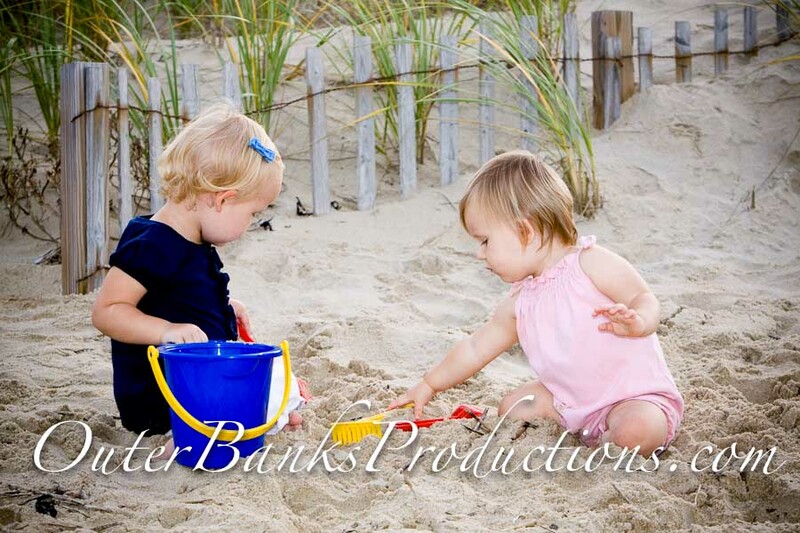 You just can’t go wrong with super fun and beachy colors! Hat, $10.00. Blanket, $15.00, photo on the beach with seagulls too? Priceless! Classic is classic for a reason. You just can never go wrong with this clothing scheme. You tell me how cool the surfboard prop is? 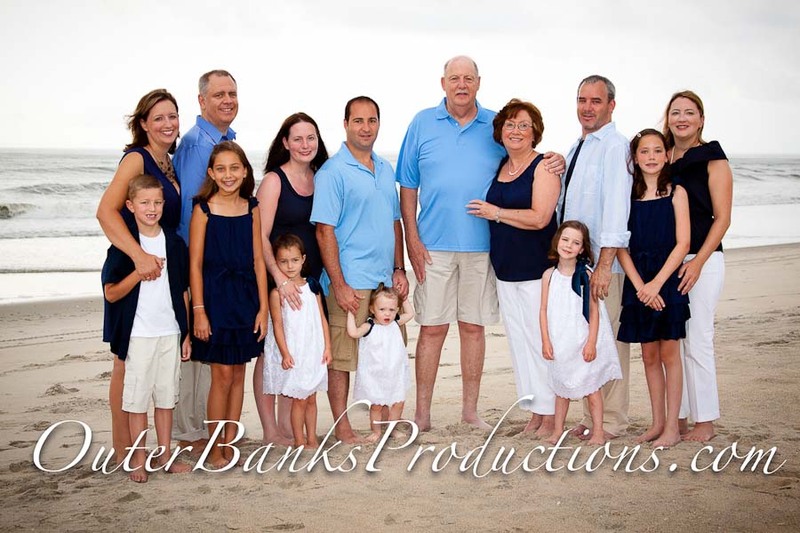 This creative family went with a lighter blue for the men and navy blue for the women. 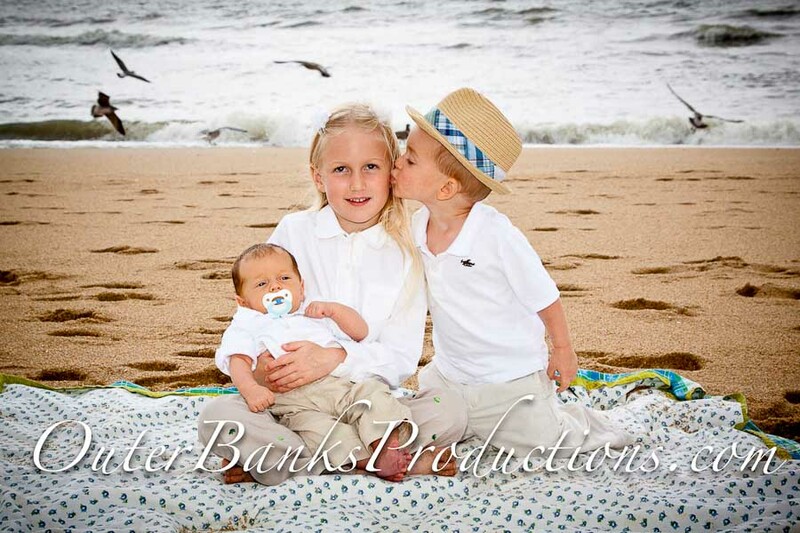 The children had white with blue accents and this was a perfect portrait! 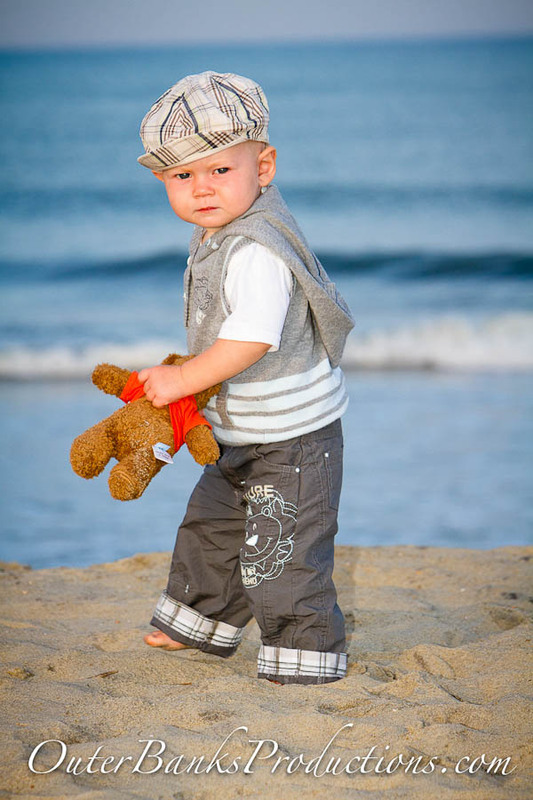 A simple hat, vest-like top, and good old teddy bear. 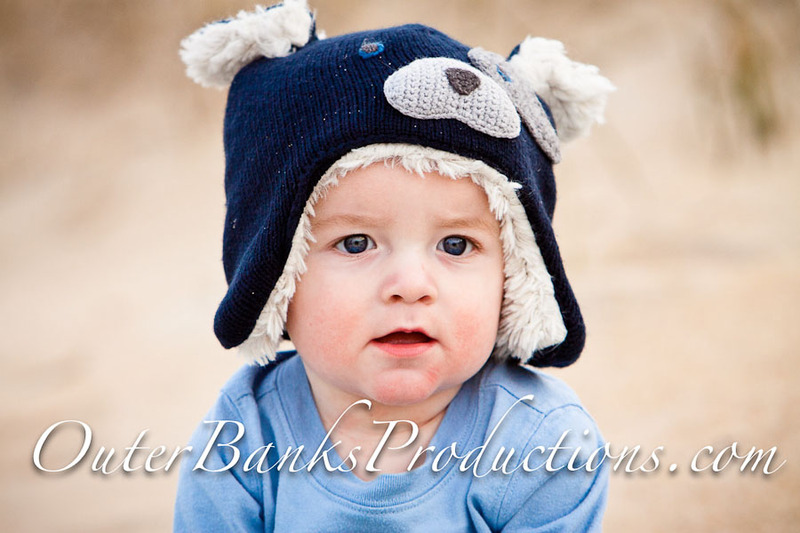 Child portrait with an adorable hat. Do you now agree that a hat can change everything? 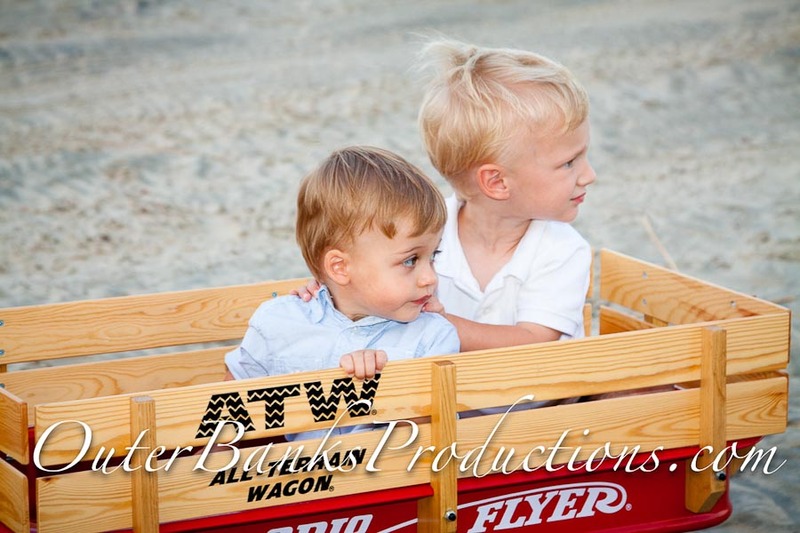 This is the way to go when the subjects are classy and casual! 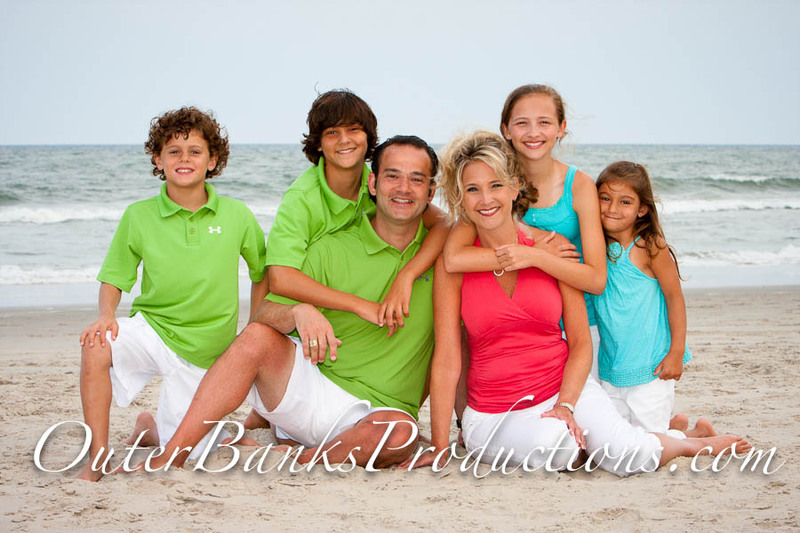 With some really good thought, this family went with a mix of colors and accented the youngest children. Totally beautiful and timeless! 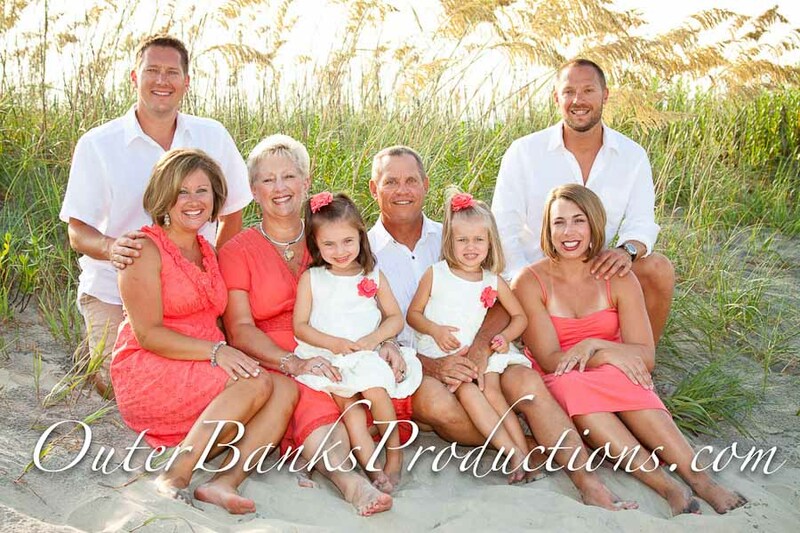 This family went above and beyond and brought out an Adirondack chair to the beach for a simple and loving portrait. This group did it so simple and it turned out wonderful! 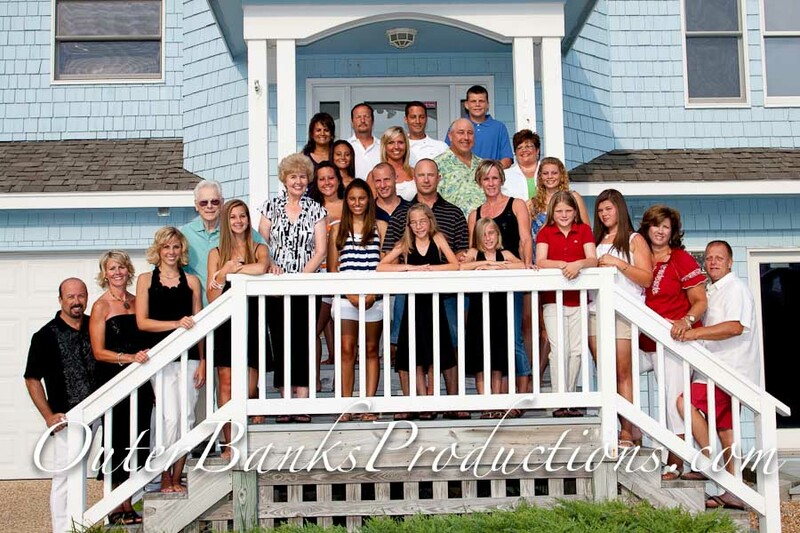 This is a multi-family group wanted a group photo on the stairs of the house and a repeat on the beach. They were color coordinated per family. 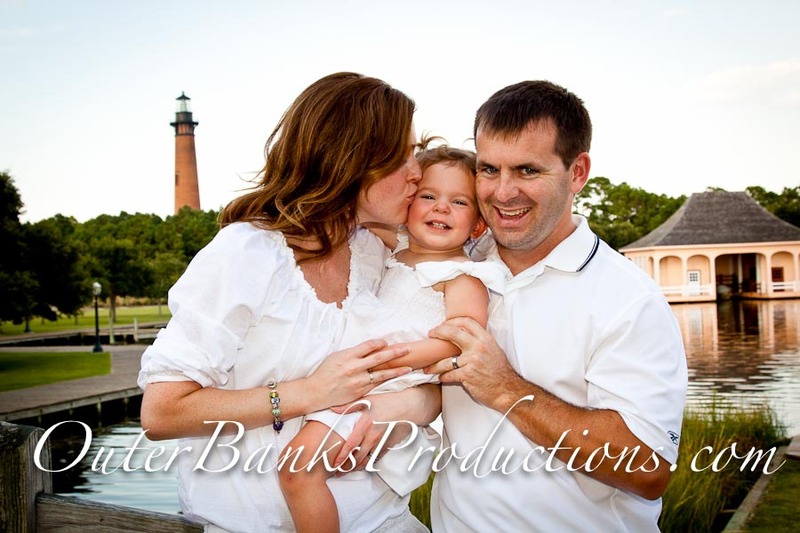 You just can’t go wrong with white for family portraits! If you have young children, bring nice, new colorful props. You won’t regret it! 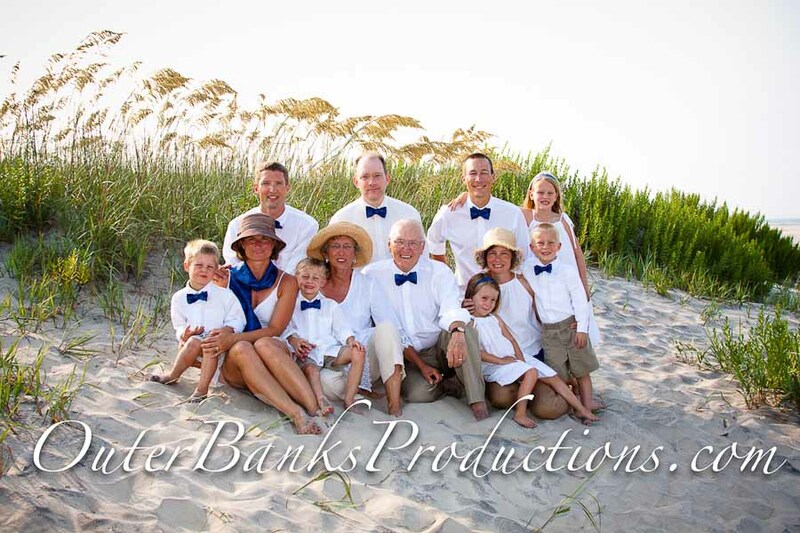 This family added the blue bow-ties for fun. They took them off and then took more images without the blue accents. This family had fun bringing hats. Yeehaw!!! 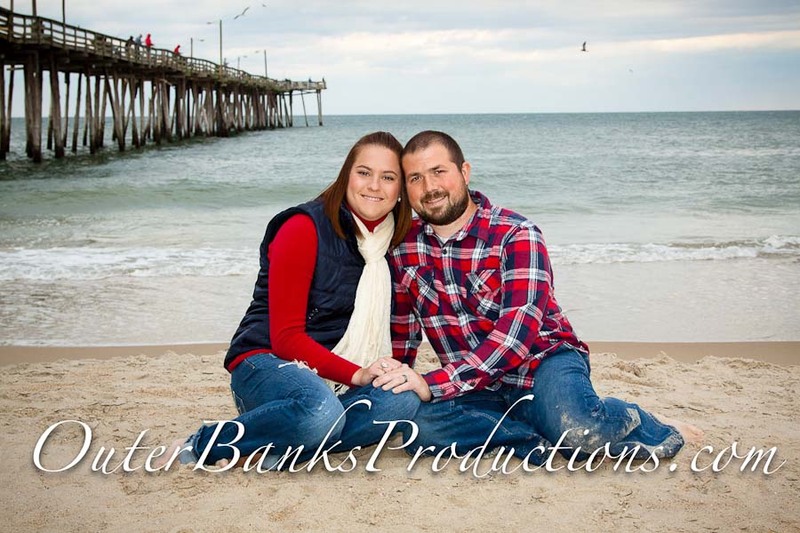 This couple had their images done in the winter. They both enjoy the outdoors. They were able to coordinate colors very nicely. 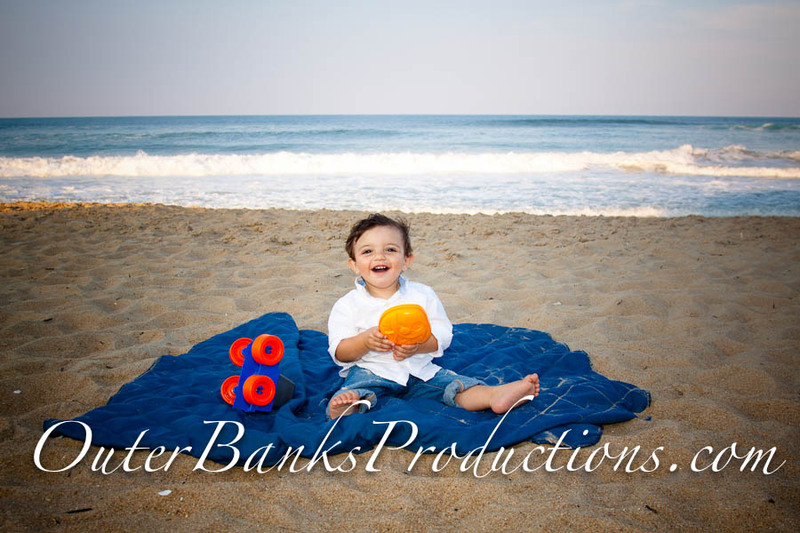 What to wear for Outer Banks family portraits! 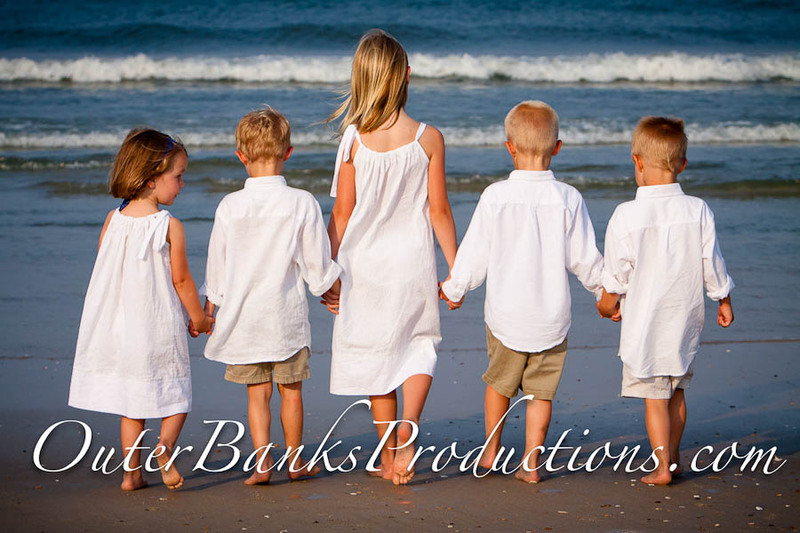 For years, everyone has always asked us to share some ideas on what their family should wear for their family portrait session. Every family is different and the first thing everyone should agree on is if it’s going to be casual or more formal. If everyone can’t agree on that first step, then don’t even bother to read the rest of our tips until you work that first point out. 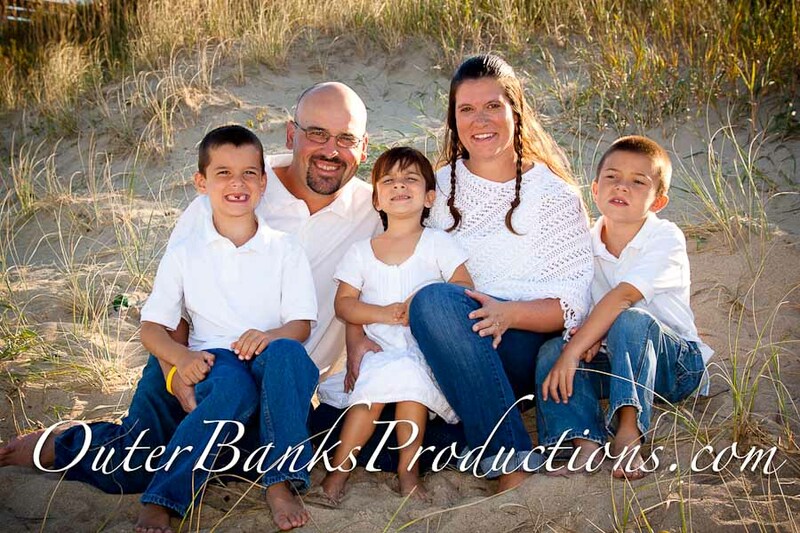 What is considered standard to wear for a professional family portrait session? 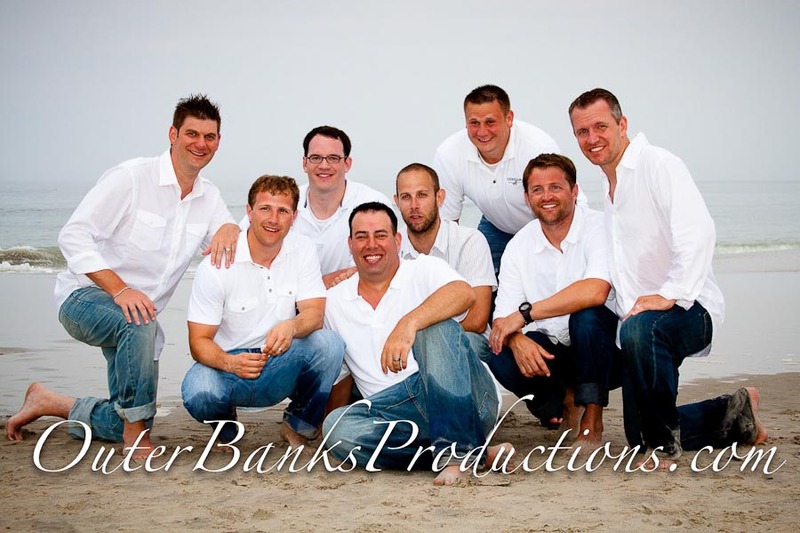 Traditionally, khaki pants or blue jeans with a white or blue shirt look great and is very common. But remember, you are not limited to this and the choice is totally yours. It is ok to be creative or different in many situations. Keep reading! 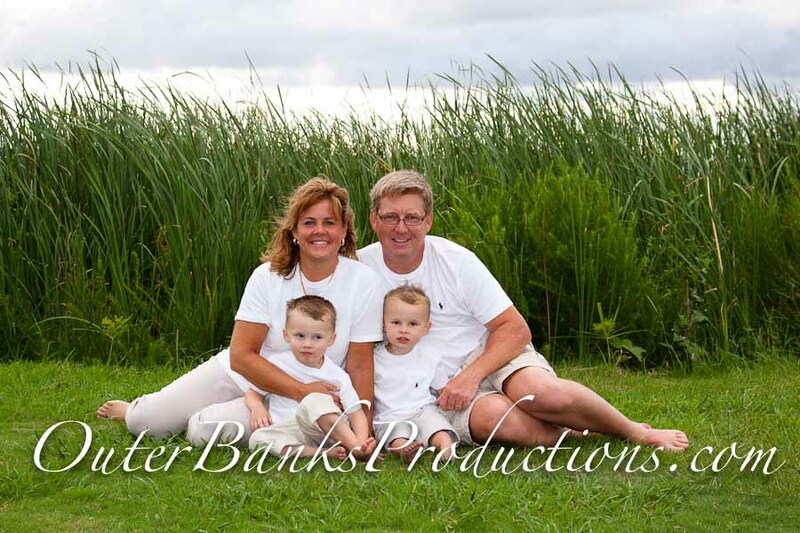 What is considered a bad idea to wear for a professional family portrait session? Don’t wear anything that distracts from the beauty of the family issues. I know this is vague but it can mean a lot of things. Some bad things would be graphics with a meaningless connection to the family and the vacation such as a random concert shirt. So are family theme shirts ok? Yes, we get this question all the time. 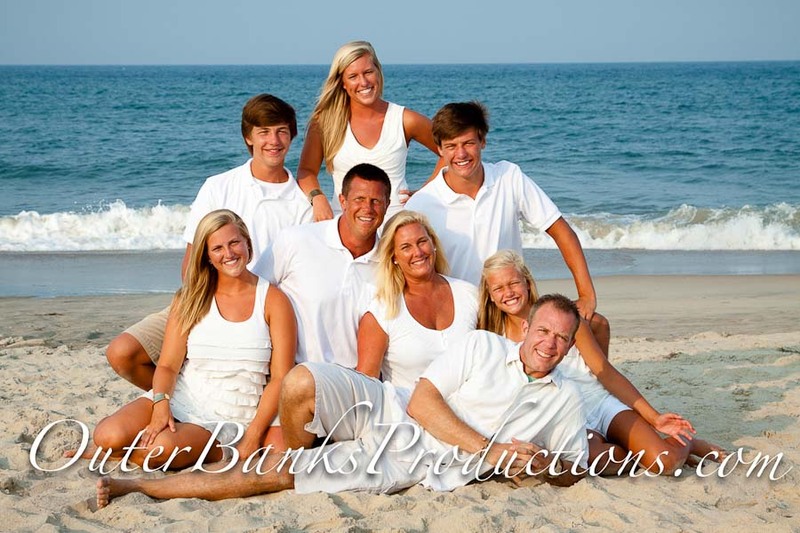 For example, picture a shirt that says, “Smith Family – OBX 2018”. This can be a lot of fun and usually, everyone has the same color. Don’t wear stripes, polka dots, complex patterns or anything else that could cause the camera to be tricked and add a rainbow haze (moiré), which can lock horrible and unprofessional. The safe rule of thumb is to just wear solid colors if at all possible. We’ve seen a lot of amazing dresses with beautiful fringe and fabric that blows in the wind. 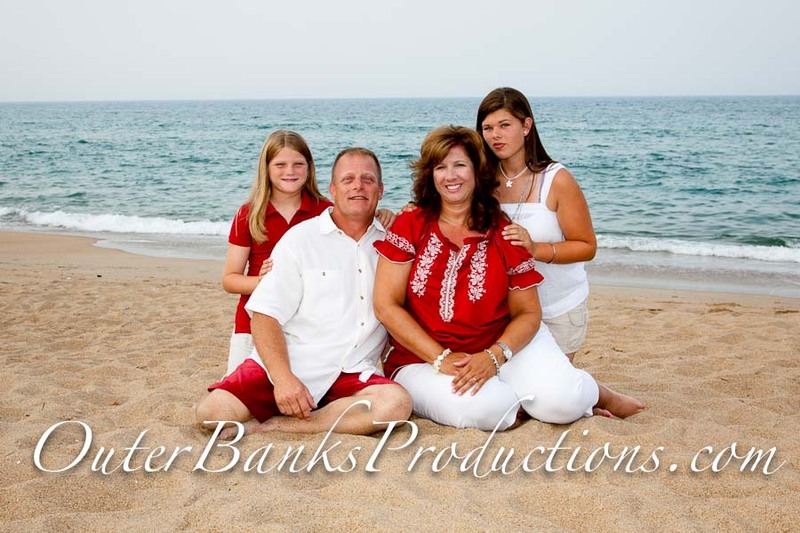 The Outer Banks is not the best place to wear those items because of the wind. We always suggest to not wear anything that can be blown in the wind, just to be safe. Woman’s shirts that can reveal a bra strap are also a poor choice of attire. It’s very expensive to have bra straps digitally removed. We can do it, but it’s best to not choose these tops in the first place. Sheer or reflective clothing. These items can cause a myriad of photographic anomalies and should be avoided at all costs because you really need a studio or a controlled lighting environment to photograph this type of clothing. Have a different color for each family. 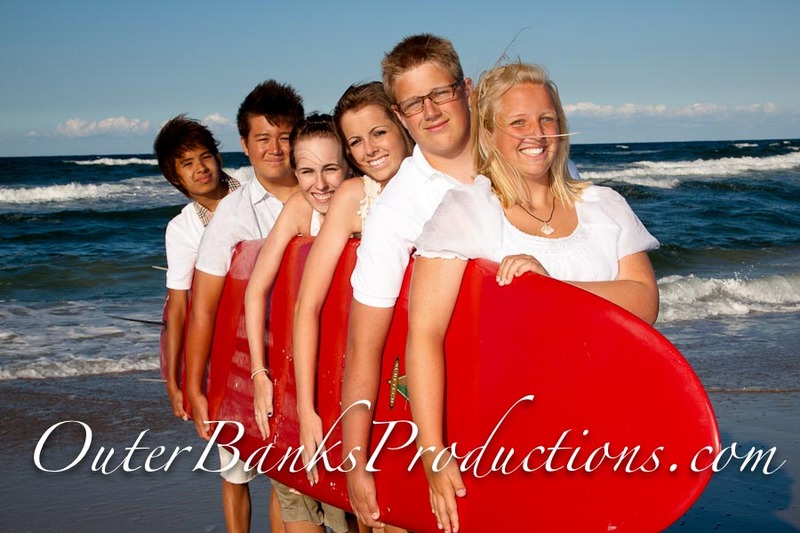 This is great for group photos that involve more than one family. Females wear one color and the males wear another. Just coordinate the shirt color and wear the bottoms you would like. Pastels have become more and more popular over the years and look wonderful! Coordinate the men in the family and allow the women to dress in dresses or outfits that compliment them. Wear a special family vacation shirt with a standardized message. Bigger letters are best. 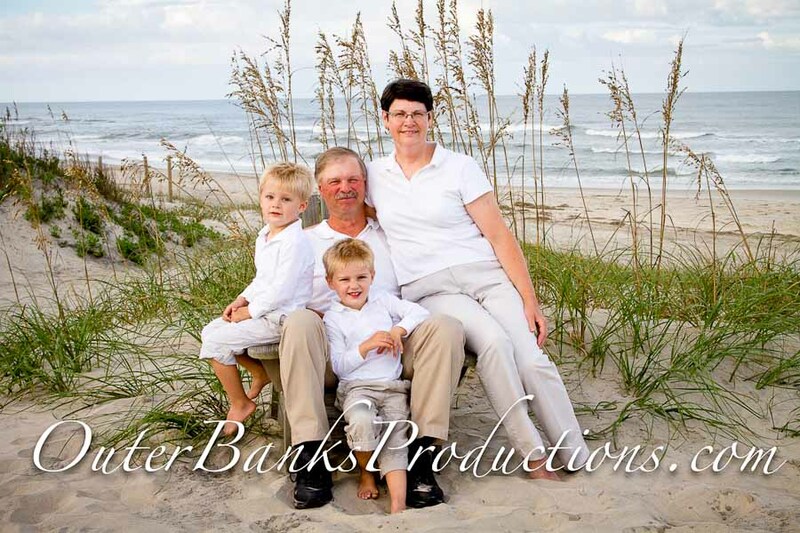 Bring a change of clothes for the individual family portraits sessions. You can change your clothes after the group photo is taken. Make sure it is something that you can quickly change into in case there are no places to change at the shoot and so you don’t lose a lot of time. Dress in your best casual wear (try to avoid competing patterns). Wear colors that look good on you. Choose colors from the same color palette. Example choose from blues or greens but don’t state a specific tone. Also, choose something easy to pose in. Not all the pictures need to be formal. Add some fun to your shots. Cowboy hats, sunglasses, feather boas and funny glasses are a few suggestions. Bring a change of clothes. Large groups should try to be as efficient as possible so you don’t lose a lot of time. Bring a blanket for hot sand. Bring a cute basket to sit in or something like a rocking horse. 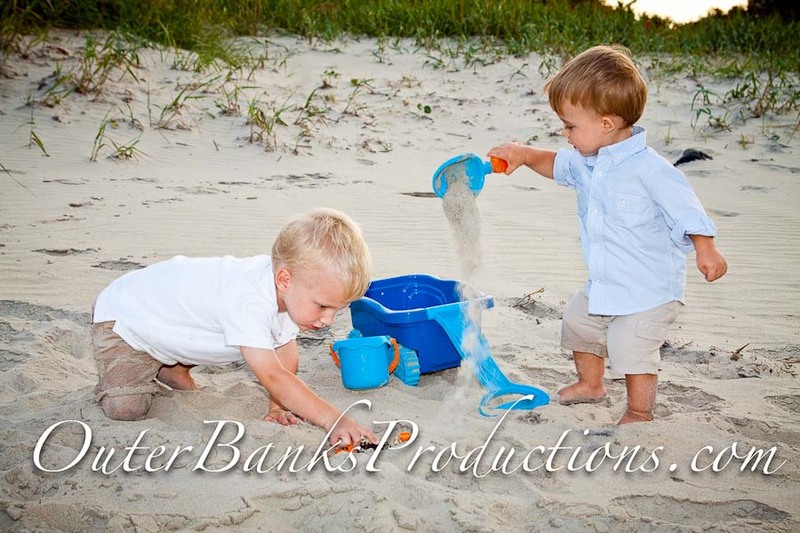 Bring a small toy for a family member or the photographer to shake for the small children. 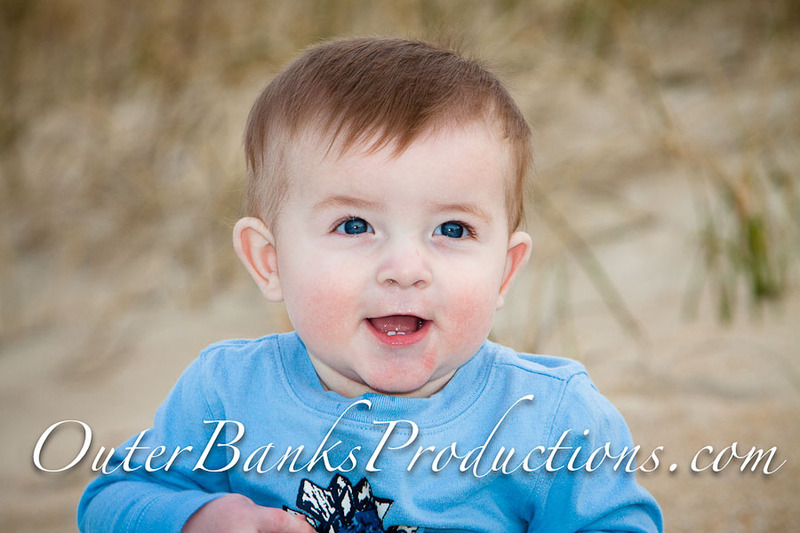 The will help the child focus on the direction of the camera for a better photo. Bring a favorite teddy bear or stuffed animal. Bring a beach chair-kid size. Bring a hat and sunglasses. Contact us to secure your date! 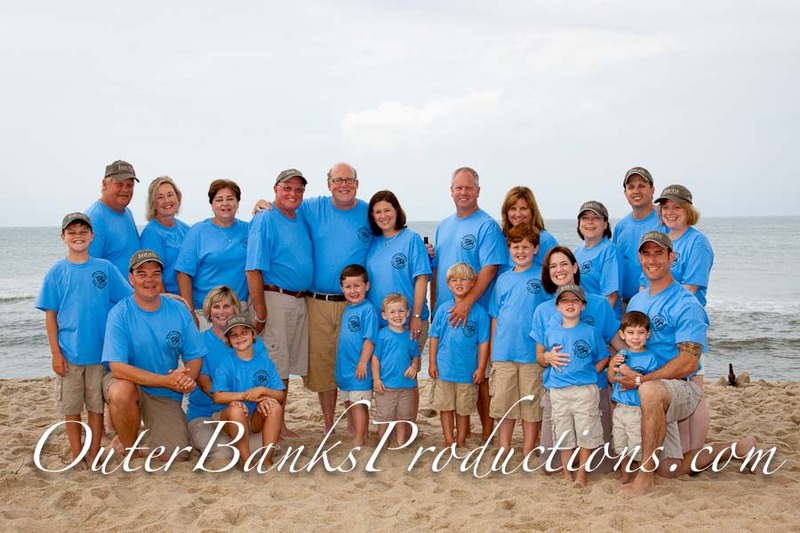 Welcome to Outer Banks Family Portraits!